Perfect timing for National Ice Cream Month. 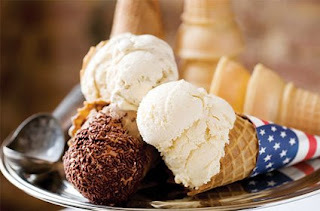 Forbes Traveler Magazine just released their list of America's best ice cream spots. We've been fortunate to taste test two of the top 10 (Ciao Bella & Brooklyn ICF-pictured on left) and we can see why they made the cut. Next stop on this list for the Scoopalicious team is Toscanini's, since its a hop, skip, and a jump away for us. We hope to let you all know how it is by the end of the summer. So if you happen to live nearby any of these you must try one because the price of gas may keep us from a few! Oh and be sure to let us all know how it was! Where is Ben & Jerry's on this list?? ?